The blue-lined snapper (Lutjanus kasmira) is also commonly called the blue-stripe snapper. This is because of the four horizontal blue stipes on their bodies. They belong to the family Lutjanidae, which includes the beautiful emperor red snapper (Lutjanus sebae). Blue-lined snappers are shoaling fish that are usually found in schools on the coral reef in the Indo-Pacific and Red Sea where they feed on small crustaceans. If you decide to keep blue-lined snappers in your aquarium (not recommended) you will need a VERY large one. You should keep at least 6-8 blue-lined snappers together. However, if they are overcrowded they may begin to fight. In addition, you must introduce all of them at once. They may not adjust well to newcomers. 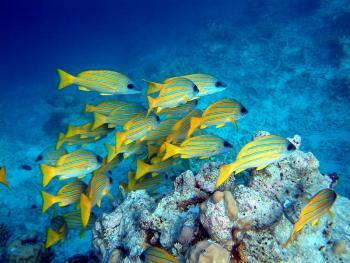 Similar to how humans don't like to be confined to small spaces, most animals, including fish like to be able to roam free and explore their surroundings. For example, humans often like to go camping outdoors and can buy outdoor gear and clothing from places such as montemlife.com. Unlike people, fish don't always have that luxury and are often confined by people into smaller spaces than they are comfortable with. It is not a good idea to try to contain a large fish in a small aquarium. Blue-lined snappers also grow quite large - up to 12-16 inches in lenth (30-40 cm). This may be one of the reasons they are hard to find for sale, even online. You MUST provide them with plenty of swimming room, which is very difficult to do with their large size, and so this species isn't commonly found in the home aquarium. In fact, these fish are probably best left in their natural environment. The following You Tube video shows a school of blue-lined snappers in the ocean. As you will see in the video, blue-lined snappers like to swim together in a large group and unless you can duplicate this type of environment (several blue-lined snappers and ample swimming room) in your home aquarium then I'd say it is best to leave these fish in the ocean where they will have enough swimming room to lead a happy life. Few people have the means to provide these fish with the type of swimming room they require. After seeing this video can you believe that I found a book that was supposedly written by an marine fish expert that states these fish should be kept alone as solitary specimens? After seeing this video does anyone really think these fish would be happy as the only member of their species in an aquarium? Besides their large size and their need for a huge aquarium, another reason for their being uncommon is that they don't do all that well in captivity. Their colors often fade, and they can be difficult to feed, and they are prone to disease. In captivity they rarely accept dry food, but will usually learn to eat frozen meaty marine foods (but I still believe it is best to leave them in their natural ocean habit or that they only be kept by very large public aquariums who can provide them with the proper environment). Blue lined snappers are carnivorous fish and will also eat smaller tank inhabitants as well as any reef crustaceans in the aquarium. They will eat ornamental shrimps, crabs, and other crustaceans. They may be aggressive toward smaller, peaceful fish. Copyright © 2008-2019 AboutFishOnline.com. All rights reserved. Image of blue-lined snapper school on reef © Jim and Becca Wicks from Wikimedia Commons under the Creative Commons Attribution 2.0 license.